Studio group portrait of six 11th grader Boys State delegates and American Legion Commodore Perry Post 525 member, Los Angeles, California, May 1, 1965. Two boys sit on stools in front, four boys stand in back flanking man wearing American Legion overseas cap, "525 California". Gradient background. All wear suits. 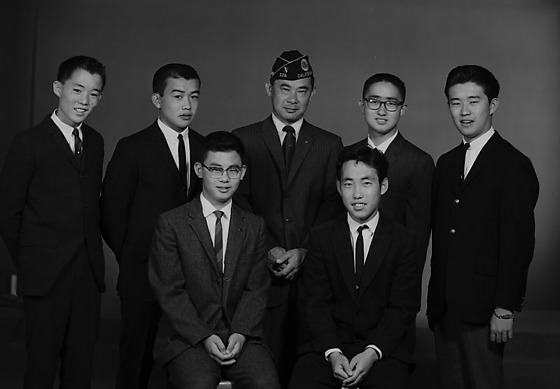 They are identified: Ray Akazawa, Chris Ishida, Kazuno Hosokawa, David Miyamoto, Thom Ono, Allan Sasaki, and Jim Kawakami of Commodore Perry Post 525. Typed on original envelope: Boys State Candidate.